SAN DIEGO, CA – Aug. 18, 2016 – Organizers of the GI Film Festival San Diego, presented by Sullivan Solar Power, have selected the new Warner Bros. Pictures animated adventure “Storks” for their upcoming Family Movie Night on Friday, Sept. 16, 2016 at UltraStar Cinemas Mission Valley at Hazard Center. This is a special preview screening, as the film will be officially released nationwide in theatres on Sept. 23. The Family Movie Night event during the GI Film Festival San Diego is designed to celebrate military families and provide a fun evening out after a busy week. Attendees will also enjoy hosted popcorn and bottled drink. This is the only family related event for the festival this year. “Storks” will be shown at three different times on Sept. 16: 6:30 p.m., 6:45 p.m. and 7 p.m. Tickets to this special preview screening of “Storks” will be available to the public on the GI Film Festival San Diego website at www.GIFilmFestivalSD.org. Festival organizers are also working with partner organizations to provide complimentary tickets to local military families. Storks deliver babies…or at least they used to. Now they deliver packages for a global internet retail giant. The company’s top delivery stork accidentally activates the Baby Factory, producing an adorable and wholly unauthorized baby girl. A race to make his first-ever baby drop results in a wild and revealing journey that could make more than one family whole and restore the storks’ true mission in the world. This animated film stars Andy Samberg, Katie Crown, Kelsey Grammer, Jennifer Aniston, Ty Burrell, Keegan-Michael Key, Jordan Peele, and Danny Trejo. GI Film Festival San Diego, presented by Sullivan Solar Power, is Wednesday, Sept. 14 through Sunday, Sept. 18, 2016, and features 28 films for, about, and by service men and women and brings the stories of America’s military to life through film. Film screenings and related events will be presented at various locations throughout San Diego County. The films come from around the United States as well as here in San Diego and range from feature length films to shorts, which gives the audience an opportunity to view a variety of stories in a short amount of time. They are presented within themed blocks so audience members can fully immerse themselves in the festival experience. Throughout the five-day festival, attendees will be able to vote for their favorite films to receive the “Audience Choice Award” at the Closing Celebration and Awards Ceremony on Sunday, Sept. 18, 2016 at the DoubleTree Hotel in Mission Valley at Hazard Center. Many of the events will be open to the public with special discounted opportunities for active duty military personnel and veterans. All Access Passes for entry into all festival events and screenings are just $85 each and are available through the GI Film Festival San Diego website at www.GIFilmFestivalSD.org. General admission tickets for select screenings and events are also on sale. The GI Film Festival San Diego is presented by Sullivan Solar Power. Additional festival sponsors are National City Mile of Cars and Scatena Daniels Communications with support provided by a grant from The Kenneth T. and Eileen L. Norris Foundation. 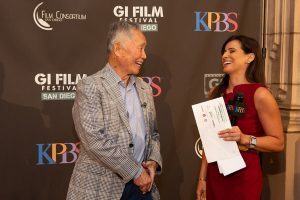 The festival is organized by KPBS in partnership with the GI Film Group and the Film Consortium San Diego.